A Detailed History of the making of the XK180. Fifty years after the Coventry-based company launched the XK engine and the XK120 sportscar, the XK180 concept car has been created to showcase the skills and talents of Jaguar stylists, craftsmen and engineers. Inspired by the great Jaguar roadsters of the fifties and sixties, the Jaguar XK180 was hand-built in the company's Special Vehicle Operations (SVO) workshops at Browns Lane in Coventry. Although not intended for production, the concept car is based on a shortened version of the supercharged XKR convertible, which was introduced earlier this year. The all-new bodywork, hand-made in aluminium, follows a styling theme that combines influences from past Jaguars with completely modern styling. The AJ-V8 power unit is modified to produce 450 horsepower and the brakes, wheels and suspension are upgraded to match the engine's performance. 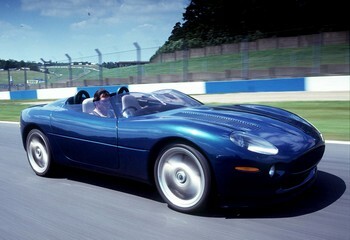 The concept car features a system of fingertip gear-selection by controls mounted on the steering-wheel, developed by Jaguar specially for this project. The detailed attention paid to the car's mechanical specification underscores Jaguar's philosophy that concept cars should not be just static showpieces but fully engineered vehicles. Many of the engineering features incorporated into XK180 have been road and track tested on a fully instrumented engineering prototype. Some thirteen and a half inches (345mm) shorter overall than the XKR, the XK180 was styled in the Jaguar Styling Department under the eye of the company's director of styling Geoff Lawson. The lines of the car are the work of Keith Helfet, a senior designer at Jaguar and best known for his work on the XJ 220. Helfet's brief was to celebrate the fiftieth anniversary of the introduction of the XK series and he drew Influences from a range of XK-powered machines, notably the D-Type. The result combines echoes of past racing Jaguars, in the shape of its rounded nose and the headrests behind the seats, and such unique Forms as the 'double-bubble' windscreen. Whilst the XK180 may be reminiscent of the D-Type in shape, this heritage is combined with modern technologies. 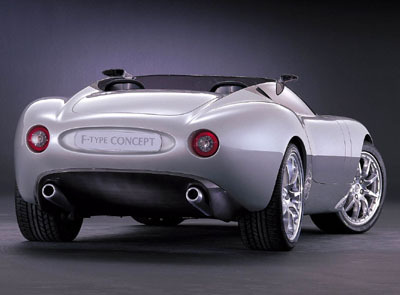 The sculptured rear end styling incorporates a unique rear light cluster specially developed by Valeo for XK180. Twenty four light emitting diodes (LEDs) provide the light source for the rear lamps, direction indicators and stop-lights. The roadster spirit is evident in the cockpit of the XK180. It uses high- performance components - in the shape of racing seats with full safety- harnesses -and then adds a touch of Jaguar luxury by trimming the seats in the finest Connolly leather. There is tradition too, with a dashboard in engine-turned aluminium carrying switches that echo the style of the great Jaguar Le Mans winners of the Fifties. The aluminium body panels were all formed by hand and assembled at Abbey Panels of Coventry. 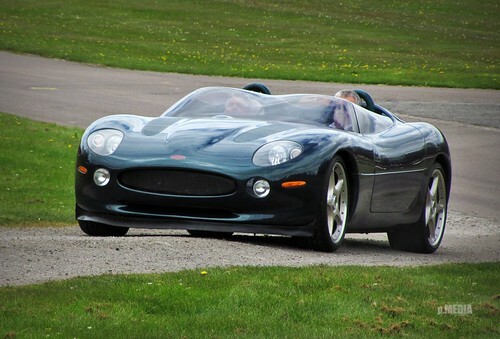 Abbey Panels Ltd. is an old-established Coventry company with long associations with Jaguar. Among many other projects, Abbey Panels have collaborated with Jaguar on the construction of the Le Mans-winning C and D-Types, the legendary XJ13 prototype and the XJ220. From Abbey Panels the aluminium body was shipped across Coventry to Jaguar's Special Vehicles Operations Department (SVO) at Browns Lane. Here. Mike Massey, Manager, SVO, Gary Albrighton, Principal Engineer and XK180 Project Manager and their team shortened the wheelbase of the XKR platform by five inches (125mm) to accept the new body style. Development of the XK180's engine was carried out at Jaguars Engineering Centre at Whitley, Coventry. The engine was modified by increasing the supercharger speed by 10 percent and this, together with modifications to the intercooler, induction and exhaust systems, raised the maximum power of the 4.0-litre unit from 370 bhp in standard form to 450 bhp. The standard five-speed automatic transmission of the XKR and the 'J-Gate' have been modified to incorporate a sequential gear selector system controlled by push buttons on the steering-wheel. This enables the driver to change gears without taking a hand from the wheel and the selected gear is indicated by a fascia mounted gauge. The XK180 suspension is based on that of the XKR, with racing-style aluminium shock absorbers incorporated in the coil spring/damper units. The suspension was developed within SVO with assistance from ride and handling experts at the Whitley Engineering Centre. The Brembo braking system, with aluminium four pot callipers, features 355 mm x 32 mm cross drilled ventilated front discs and 315mm x 28mm cross drilled ventilated rear discs. The unique-styled, two-piece aluminium wheels are the largest ever fitted to a Jaguar. The wheel rims are twenty inches in diameter, and are nine inches wide at the front and ten inches wide at the rear. They are fitted with super-low-profile Pirelli tyres - 255/35 ZR2O Pzero Direzionale at the front and 285/30 ZR2O Pzero Asimmetrico at the rear. Building the Jaguar XK180 an exercise in accelerated development Jaguar's XK180 concept car progressed from an idea to a running reality in a little over ten months. Skilled craftsmen from the company's Special Vehicle Operations Department, working closely with a small group of stylists and engineers who could be spared from Jaguar's intensive new model development programmes, had just forty two weeks to complete the concept car in time for the Paris Motor Show. Time and resources may have been limited, but energy, enthusiasm and pride were available in abundance, and the XK 180 roadster can take its place alongside such illustrious forebears as the XK 120 record-breakers, the D-Type and the XJ220. First thoughts about the new car were influenced by the XK 120 that established new speed records on a stretch of motorway at Jabbeke in Belgium in 1949. Its performance dispelled once and for all any doubts about whether the XK 120 could achieve the 120 miles an hour its name implied and it was the basis on which every succeeding XK-engined performance car was created. The second influence was the Jaguar D-Type, whose superb styling cloaked Le Mans-winning performance in aerodynamic good looks. Vehicle Operations (SVO) department, discussed the project with Chief Stylist Geoff Lawson and SVO Manager Mike Massey. The conclusion that was reached was that a shortened version of the XKR with a more powerful engine would be a fitting basis on which to start. The XKR platform had been modified by SVO, with five inches cut out of its cockpit and provision for shorter front and rear body sections incorporated. While this was going on, Keith Helfet was working in the styling department on first designing the new body and then converting that design into a full-scale clay model. Keith Helfet supervised the detailed modifications to the clay model, which would be used to create the tooling aids and moulds from which the aluminium panels would be formed. For a production car, the clay would have been digitised in order to create tools, but such was the rush on this project there was no time - and no need to use such modern 'time-saving' methods for a one-off vehicle. 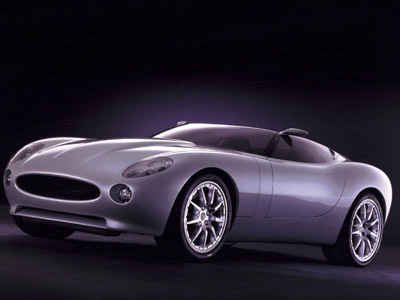 As the preparations for creating the body continued, SVO was creating an actual 'cut and shut' XKR to act as a test 'mule' for the shorter, more powerful, concept car. Since it had to be capable of being driven to the levels its modifications would make possible, the engineers wanted to evaluate the proposed chassis and engine changes in real world conditions. The 'mule' was a purposeful evolution of a standard XKR, equipped with a full racing safety- cage that spoke volumes about its performance and purpose.Working from former shapes created on the basis of the clay styling model, Abbey Panels' craftsmen began to form every panel of the new car. They worked entirely by traditional methods, rolling and shaping the components using nothing more than skilled application of hand and eye. he rush on this project there was no time - and no need to use such modern 'time-saving' methods for a one-off vehicle. The body began to take shape in early May, and by mid-June it was ready for painting. As in any concept car, colour plays an important part in the overall design, and Keith Helfet's choice looked back to one of his favourite Jaguars. the D-Type. Helfet selected a paint that combines echoes of the metallic blue of the Ecurie Ecosse D-Type which won at Le Mans in 1957 with undertones of green and gold. It is a colour which would have been impossible to achieve in the days of the XK 120, and is one of the most obvious signs of Nineties technology in the new car. By now the mule was racking up the miles necessary to test and fine-tune the engine and chassis modifications. All these modifications had been carried out by engineers at Jaguar's Technical Centre at Whitley, and they were designed to add power and performance which would match the car's image and heritage. Engine modifications increased the 370 horsepower available in the production XKR to an even more impressive 450, while racing suspension with adjustable dampers and larger brakes, wheels and tyres ensured the extra power was well controlled. Using the handling circuit and the high-speed track at MIRA, the engineers began to fine-tune the modifications in order to come up with a specification the SVO workshop could follow when the time came to start building the car. Meanwhile, Helfet and his colleagues began to work on the cockpit design, styled, like the exterior, with a retro-influenced cloak over modern technology. Ergonomics were important, as were looks, but Helfet's design policy was also heavily influenced by tactile sensations. "I wanted everything you touch in the cockpit to be metal or leather," he explains. "It formed all my ideas about the instrument-panel, where I wanted the switchgear to have a look and - just as important - a feel of past Jaguar sports and racing cars. "It took four weeks to design the interior and another two weeks to create the moulds that would be used to form the necessary panels. It was now July, and the Paris launch date was less than three months away. But everything was coming together according to schedule, and final assembly of the car was under way under a cloak of secrecy in the SVO workshop. While the body-men assembled the aluminium panels, the chassis specialists were building up the special components Whitley had specified to achieve the required handling. The specially-prepared AJ-V8 engine was installed by workers who had started at Jaguar when the six-cylinder XK power unit was Jaguar's mainstream engine, while trimmers who had shaped the leather to cushion royalty and statesmen set to work on the racing seats and harnesses made necessary by the new car's performance. In the electrical department, work began on adapting switches with the style of the Fifties and Sixties to operate with Nineties technology. It was not an easy task, for even such an action as turning on the headlamps of one of today's Jaguars involves more electronics than were to be found in a complete XK 120. Working with outside specialists who supplied such components as the wheels and the uniquely-shaped windscreen. SVO worked throughout July, August and the early part of September. By the middle of the month the car was ready to be photographed, and in the following week all the tiny detail jobs were completed before it was carefully loaded for transport to the Motor Shows.